)Having reached the end of a second arc – that’s two arcs of six books apiece – I once again felt I had peaked. I was especially pleased with ‘The Burning Man’ because it matched the mood of my city. I had got caught up in the banking riots, and it was obvious that before Brexit this was the topic most on people’s minds. Throughout my years in different London flats from Brixton to Kensington, Kentish Town to Belsize Park, I had been on more protest marches than you could wave a banner at, so I remembered how unpredictable street protesting could be, and the book felt fairly authentic. I try to put personal experience in each novel, just to give it a bit more grounding. After Book 12 I worried that I would level out and be in danger of getting into a holding pattern. Book 12 had an apocalyptic, ‘ending’ feel. 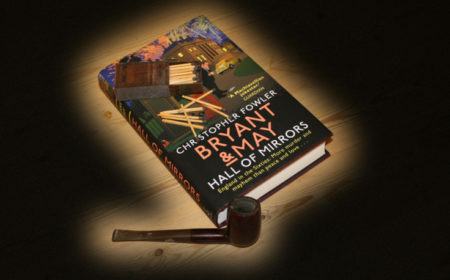 To buy myself time when I would work out what to do next, I starting writing up some Bryant & May missing cases, following the old idea of Holmes and Watson discussing unseen investigations. I wasn’t sure whether they would adapt to short stories, but found myself really enjoying the process, so much so that I worked hard to tie them all together into a cohesive book. ‘London’s Glory’ sold better than usual collections, and kick-started my thinking into new areas. Several of the stories featured details from ongoing London court cases with the names changed. I added some crazy peripheral characters and plot twists, and the book surprised me by slotting together well. It got me onto ‘Strange Tide’ and ‘Wild Chamber’, which pushed character development more and slightly toned down the wilder elements. Of course the books are still romps, but I could never write a Bryant & May novel with a grim, totally serious tone because I felt it would lose too much. Besides, Marcia Clarke’s crime novels taught me that a real-life prosecutor like Clarke does her job not just because she feels compelled to, but because it’s enjoyable. To say that Bryant & May love their jobs is a massive understatement. They can only survive by working. I’d never tackled a real Agatha Christie-style novel (I wish I’d been offered the gig of taking over the Poirot stories) so I next wrote one of my own. ‘Hall of Mirrors’ is in some ways a break, an assessment of where I was, and a chance for new readers to catch up, although I was pleased with the way the plot worked and had fun with the ending. Now, ‘The Lonely Hour’ is in preparation for a March release (we’re in the middle of the edit/proof process) and it’s very firmly back in the ‘Wild Chamber’ mould, but there’s a twist too, as I’m doing an ‘inverted mystery’ in which you know the identity of the culprit from the outset, and still pull out a surprise or two. (I think I actually made my editor scream at the end of the book). But I’m also developing the characterisations and applying the lessons I learned writing the e-book ‘Little Boy Found’, and this will hopefully lead me to new plots. I’ve also completed ‘England’s Finest’, a second volume of the missing Bryant & May cases, with slightly longer stories, and that leaves me with a further two volumes to reach twenty. How could I stop before then? I don’t have any immediate ideas for settings or themes yet, but I’m working on two non-Bryant & May books at the moment so I have a little time to think about what I want to do. My main hope for the series is that it keeps readers perpetually surprised and pleased. If I get bored, it will reflect in the prose – so it’s important to keep finding new enthusiasms. I don’t want to do one with a Brexit background – too polarising – but there’s more fun to be had with London’s secret places. In the spring I’ll embark on my seasonal tour of the city, looking for locations and ideas. For now, I’m working on something new and different, just to give me a break from the old fellas, so that they don’t occupy my thoughts quite so much! So glad you are continuing with your wonderful Bryant and May stories. I read them as they come out and reread favourites and now enjoy listening to them as recorded books. I especially enjoy the history and humour. Looking forward to the Hall of Mirrors! Be interesting to have a body in Holyrood Park of a friend of Bryant’s after an Independence rally. And they run into Rebus. Would Rankin coauthor sometime? Like Pratchett and Gaiman. 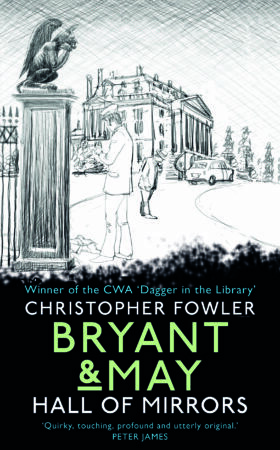 What a fantastic series of articles on the Bryant and May series – looking forward to the Lonely Hour. Is there a release date for England’s Finest yet? Not yet, Mark, as my editor hasn’t even read it yet – but it’s delivered and sitting in the wings. And Bruce, I think Mr Rankin would be wisely wary of far more famous investigator! Thank you for this 3-part post that goes a long way to explain the thoughtfulness in which the series is written. What strikes me about the writing is the generosity of the author. He could say the man wore a brown coat with a collar drawn up around his neck. Instead, you get a whole paragraph that even includes the contents of a pocket and ends with a nod to the boy within who retains his curiosities. It really is all superbly done. Thank you. I guess you could do a London blag story ala The Sweeney only the break in is at one of the Mausoleums around London, but what or who have they stolen and why? It doesn’t always have to be murder, a number of Father Brown tales are not murder cases. Wayne, I’m trying to write a suspense novel without a murder at the moment – it’s great fun having to follow rules! That sounds good, now I’m wondering how will you create the suspense; look forward to reading the book. Thank you for these articles on your B&M detectives and their development. I read the first book years ago and have been hooked since. My Favourite is still that first book ‘Full Dark House’. I find this is the book I read the most frequently from the series. Long may you continue writing them. I enjoy every single word in all of the books. Well thank heavens there are more to come. Since I first stumbled on the Water Room in 2012, I’ve had more enjoyment from B&M than any of the other hundreds of books I’ve read since them. As someone else said, please don’t kill them off – just stop writing when you’re done. I really feel as if I know the core characters personally. Oh and Chris, my new album is out soon – all 60s/70s style themes and of course I’m including Waterloo Bridge (tidied up since you last heard it). There’s a story in the sleeve notes detailing the life and death of the tracks’ fictional composer and I mention B&M. Will send you a copy of the vinyl when it comes.